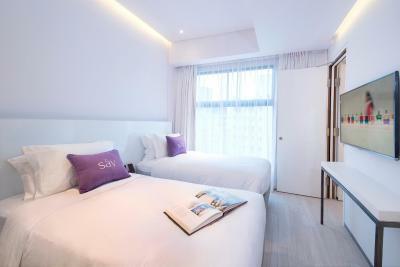 Nicely located new hotel in Hong Kong with reasonable rates. Staff is super friendly and helpful. It’s super clean and modern. Everything. They are very professional and take care of every point. I recommend this hotel for stay. The service is good especially the concierge who called taxi for me. The mattress is very comfortable. I sleep very well during the trip. Hotel staff prepare some fruits and birthday card for my mother on her birthday day. We are surprise and happy with the staff arrangement even we didn't expect anything. Room is small, but overall we are happy with the staying experience. I like this hotel because it is near my office and I can find everything I need nearby. From public transportation to restaurants all around. It is very clear and well-taken care off. 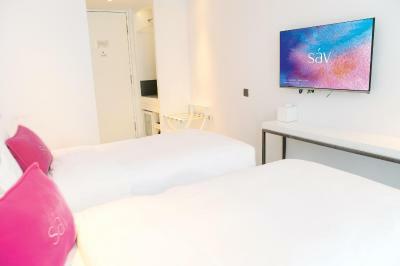 Although there has been a slight increase on their prices, they are still quite Ok.
Hotel Sav This rating is a reflection of how the property compares to the industry standard when it comes to price, facilities and services available. It's based on a self-evaluation by the property. Use this rating to help choose your stay! 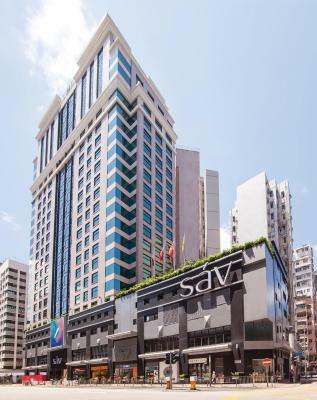 Located close to the city center, the 4-star Hotel sav is only a 5-minute walk from Wonderful Worlds of Whampoa. 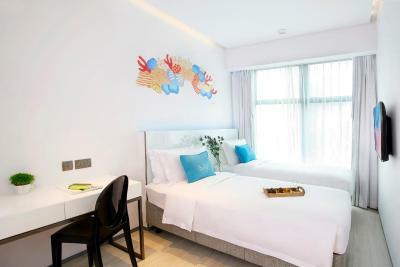 It features comfortable guest rooms with free smart phone rental service.Hotel is decorated with chic and colorful decorations, a fitness center and 2 on-site restaurants. Free WiFi is available in all areas. 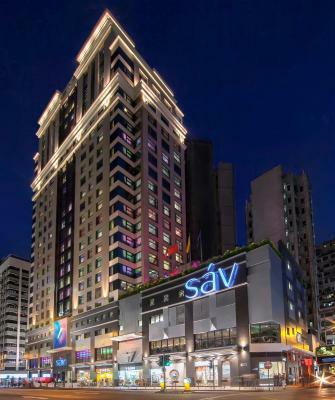 Hotel Sav is a 10-minute walk from Hung Hom Station (East Rail Line and West Rail Line). 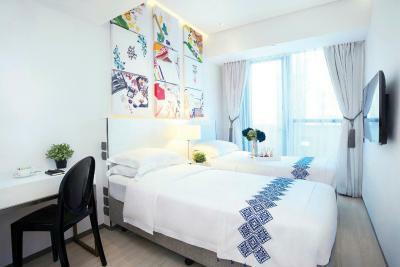 The property is only a 5-minute-walk to Whampoa MTR Station Exit B. 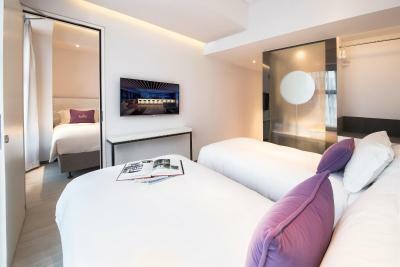 It is an 8-minute drive from Temple Street Night Market, a 10-minute drive from Ladies Market, Tsim Sha Tsui or Harbor City Shopping Mall and a 15-minute drive from Kai Tak Cruise Terminal. Hong Kong International Airport is 45 minutes' drive away. 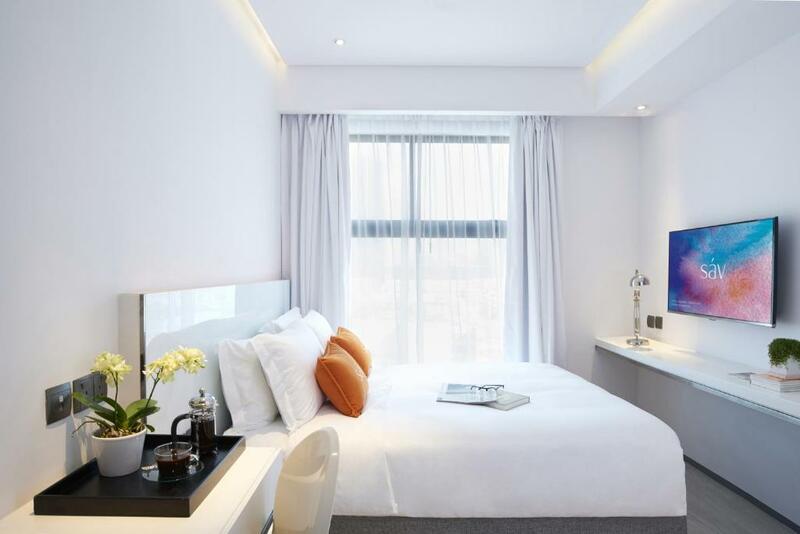 Offering city views, each airy, bright room features modern decor and includes air conditioning and a mini-bar, plus free smartphone rental service with free local and IDD calls to designated countries and unlimited 3G data plan. Featuring a shower, private bathroom also comes with a hairdryer and free toiletries. Extras include a safety deposit box. 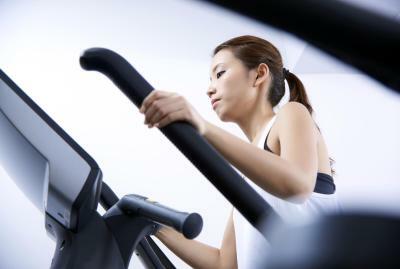 Guests can recharge with a workout at the fitness center. 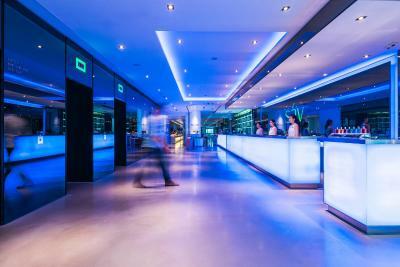 Convenient services including concierge service, currency exchange and free shuttle bus are all provided upon request. 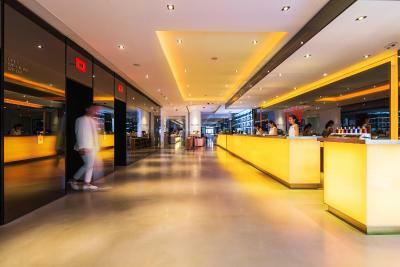 Guests may find a wide array of retail shops and restaurants within easy reach. 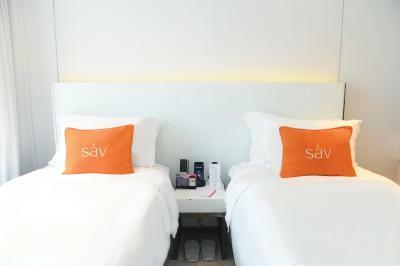 When would you like to stay at Hotel Sav? 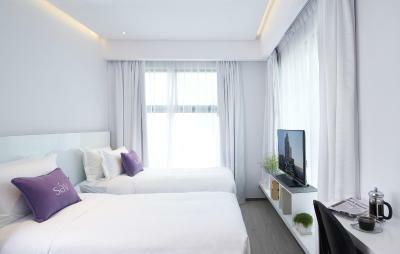 With contemporary décor and a relaxing ambiance, this twin room features a sense of calm and escape from the bustling city. 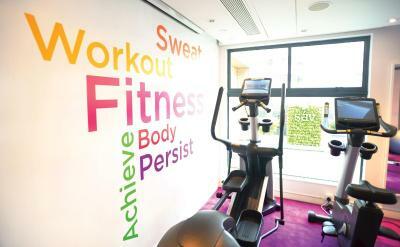 Guests can enjoy complimentary WiFi, free mini-bar (one full stock per stay) and use of the smartphone with unlimited 4G data and free use of the hotel’s 24-hour gym facilities. Private parking is available on site (reservation is needed) and costs HKD 300 per day. 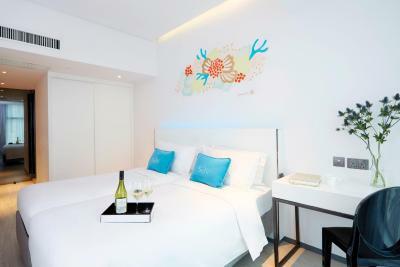 This deluxe guest room features contemporary décor fuzed with the environmentally-friendly and e-centric facilities. Guests can enjoy complimentary hotel-wide WiFi, mini-bar (one full stock per stay), a welcome fruit plate, daily buffet breakfast for up to 2 staying guests, pressing service for 1 suit or dress, and free use of the hotel’s 24-hour gym facilities. With contemporary décor and a relaxing ambiance, this quadruple room features a sense of calm and escape from the bustling city. 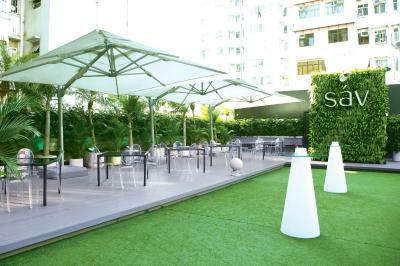 Guests can enjoy complimentary WiFi, free mini-bar (one full stock per stay) and use of the smartphone with unlimited 4G data and free local and IDD calls to designated countries (including Mainland China, Singapore, South Korea, Thailand, USA, Japan, UK, France, Germany and Australia). 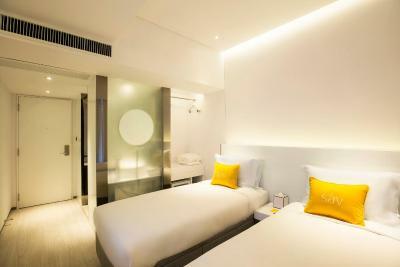 Located on high floors, this stylish room features contemporary décor, environmentally friendly and e-centric facilities. 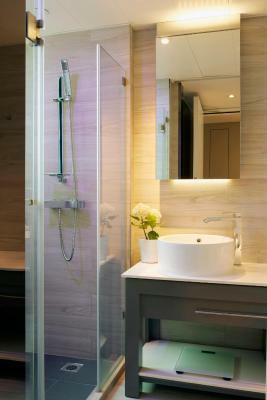 It provides a welcome and elegant haven away from the city. Guests can enjoy the daily breakfast buffet for 2 people, complimentary WiFi, free mini-bar (replenished daily), branded coffee machine, welcome fruit plate and drinks, use of a smartphone with unlimited 4G data, pressing service for 1 suit or dress and free use of the hotel’s 24-hour gym facilities. 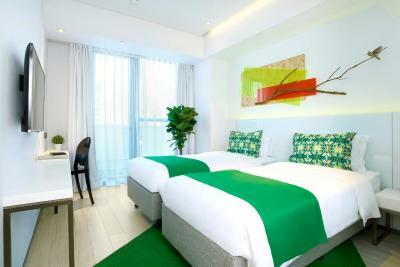 This twin room offers guests environmentally friendly living space and e-centric facilities. Guests can enjoy daily buffet breakfast for 2 people, complimentary WiFi, use of the smartphone with unlimited 4G data, complimentary mini-bar (one full stock per stay), a welcome fruit plate and drinks and free use of the hotel’s 24-hour gym facilities. 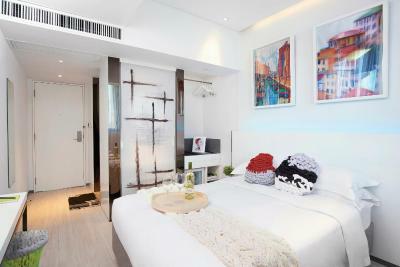 Located on the 20th floor, the guest room features creative works of influential local designers, fashion bloggers and celebrities. Guests can enjoy daily buffet breakfast for 2 people, complimentary WiFi, free mini-bar (one full stock per stay), welcome fruit plate and drinks, use of the smartphone with unlimited 4G data and free use of the hotel’s 24-hour gym facilities. 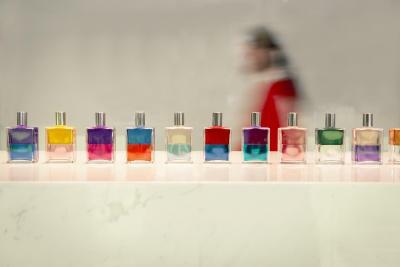 In addition, guests will receive a gift selected by the designer of each room upon each stay. 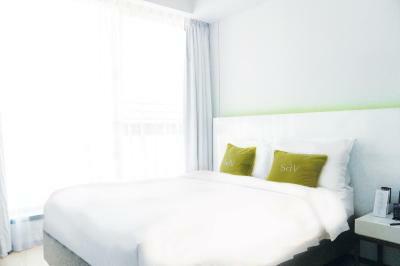 This double room features an environmentally friendly living space and e-centric facilities. Guests can enjoy daily buffet breakfast for 2 people, complimentary WiFi, use of the smartphone with unlimited 4G data, complimentary mini-bar (one full stock per stay), a welcome fruit plate and drinks and free use of the hotel’s 24-hour gym facilities. With contemporary décor and a relaxing ambiance, this double room features a sense of calm and escape from the bustling city. Guests can enjoy complimentary WiFi, free mini-bar (one full stock per stay), use of the smartphone with unlimited 4G data, and free use of the hotel’s 24-hour gym facilities. 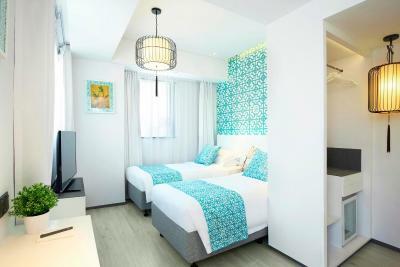 This double room features contemporary décor, and a living space fuzed with the environmentally-friendly and e-centric facilities. Guests can enjoy complimentary hotel-wide WiFi, mini-bar (one full stock per stay), a welcome fruit plate, daily buffet breakfast for up to 2 staying guests, pressing service for one suit or dress, and free use of the hotel’s 24-hour gym facilities. Located on the 20th floor, the guestrooms feature creative works of influential local designers, fashion bloggers and celebrities. Guests can enjoy daily buffet breakfast for 2 people, complimentary WiFi, free mini-bar (one full stock per stay), welcome fruit plate and drinks, use of the smartphone with unlimited 4G data and free use of the hotel’s 24-hour gym facilities. 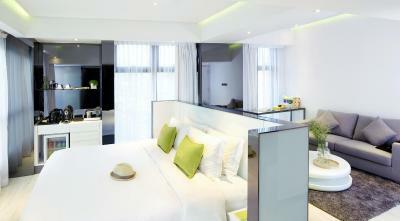 In addition, guests will receive a gift selected by the designer of each room upon each stay. 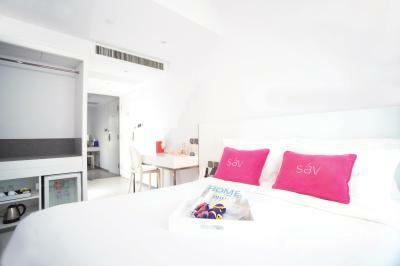 Guests enjoy free upgrade from Superior Rooms to The Sav Collection - Double or Twin Room. 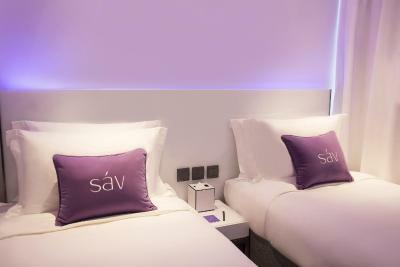 Hotel sáv is designed using seven sáv Colors: orange, red, yellow, pink, green, purple, blue to create an atmosphere of peace, positivity and well-being. 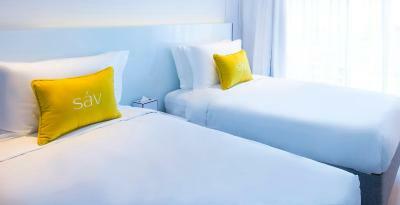 We feature color-themed guest rooms, restaurant and bar. House Rules Hotel Sav takes special requests – add in the next step! One child under 16 years is charged HKD 495 per night when using existing beds. 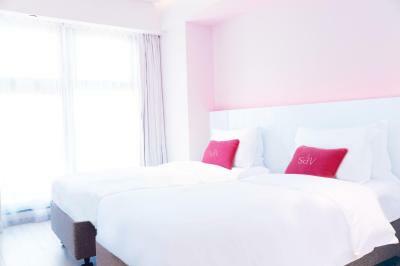 All children under 12 years are charged HKD 495 per night for extra beds. 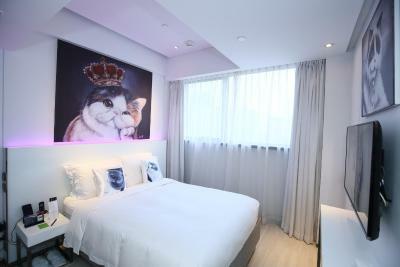 Any additional older children or adults are charged HKD 495 per night for extra beds. 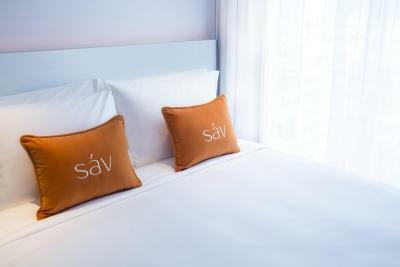 Hotel Sav accepts these cards and reserves the right to temporarily hold an amount prior to arrival. For Non-Refundable bookings, individual credit cards are required for each room booking and the total amount of the room rates for the entire stay will be charged on the given credit card after the reservation is made. Please present the same credit card used to guarantee your booking when checking in/making payment at the hotel. For any reservation under the standard cancellation policy, approval code will be obtained from the given credit card as a guarantee. Please note that the hotel can offer rental service of smart phone offering unlimited 4G data plan and free local and IDD calls to specific countries (Mainland China, Singapore, South Korea, Thailand, USA, Japan, UK, France, Germany and Australia) for all guests. The room is smaller than expectation. The public area on P is awesome. Rooms are quite small, and absence of a small night stand at one side of bed is inconvenient. Staff were generally helpful. HK isn't exactly renowned for polite behavior but Sav was a pleasant surprise. Difficult to get taxis in this area. You have to request the hotel to get you a taxi every time. 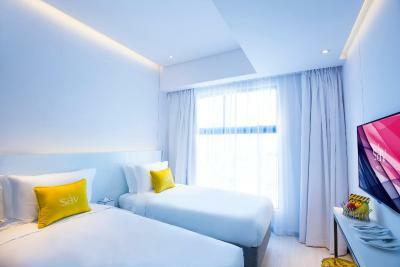 Atmosphere and extra things in room like the handy, soft drinks, etc. We didn't realise the 'Do Not Disturb' light was on. So we didn't have our room cleaned for the whole 3 nights. We arrive late on Friday night. Went out the whole day on Saturday. When we got back, the room was not cleaned. We were so tired, so we didn't contact the staff yet. The same thing happened the next day. Except that the housekeeper left a note under the door saying we left the 'Do Not Disturb' light on. But I don't even know where the switch is! I tried looking for it, but it was our last night anyways. It'd be nice if the housekeeping left a note since the first night. The convenient location and friendly staff. The place is clean and super comfy. The bathroom is quite spacious. My favourite thing is the water pressure is great. It is nice to have a hot shower after long rainy day. 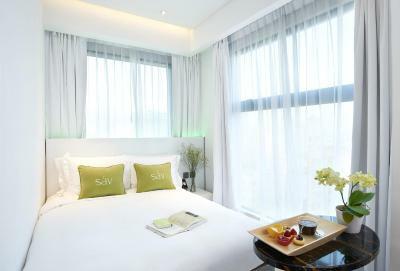 Third time I have stayed at Hotel Sav pre or post a cruise from Kai Tak. Location great to and from cruise terminal, but otherwise still a great place to stay. Close to train line, lots of options around for shopping and eating. Staff friendly and helpful and love the coloured outfits. Rooms relatively spacious for HK with all needed facilities. In the past the air conditioning has been a bit cool, but was good this time. Its good facilities at a good price and would happily stay here again if in HK. The rooms are very small, and the lifts can be a bit slow but for the price it is still a great place to stay. 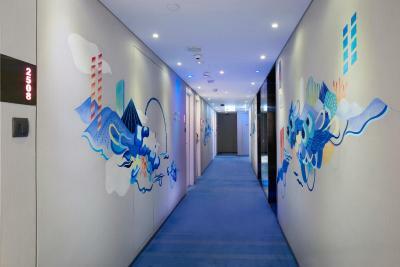 The hotel is very well presented, clean and welcoming. Staff are friendly and the location is close to transport and plenty of dining options. This hotel is in a local neighbourhood not a tourist hot spot.